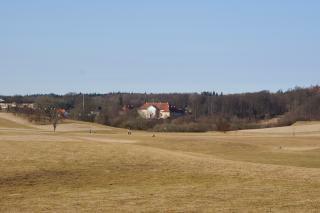 Skjoldenæsholm Manor is set in beautiful farmland, with forests and lakes in the rolling mid-Zealand countryside. The oldest building in the grounds is from 1662, whereas the main building was built in 1766 in a neo-classical style, perhaps by architect Philip de Lange. Skjoldenæs, which was its original name, is a very old manor house. One kilometre south on a spit of land in Valsølille Lake, a castle mound called 'Slottet' (the castle) is all that is left of an ancient royal castle. The castle was linked to Valdemarsvejen, a road belonging to Zealand's medieval road network. Sections of the road can still be found in the nearby forests where you can walk in the footsteps of King Valdemar Atterdag. Most manor houses stand in enchanting surroundings – and Skjoldenæsholm is no exception. It is set in beautiful countryside with a strategically good location near plenty of resources and attractions. The large hilly forests and common land to the north supplied timber, as well as grazing land for cattle, free-range pigs and hunting opportunities. The lake by the park supplied water and fish for household consumption. And hay from the meadows kept the animals fed through the winter. Over the years, more farmland was acquired for the manor house by demolishing farms in what was once the village of Valsølille to the south. In about 1800, Major Brunn de Neergaard, a relation of the present owner, built Valsølillegård on the village square. The manor house, with its rolling fields, farm labourers' cottages, stone walls, forests, old trees, lakes, meadows, traces of roads and castle mound tells the tale of Skjoldenæsholm's historical past.